It’s not a coincidence Josh Koscheck (Pictured) is one of mixed martial arts’ most hated fighters. The controversial UFC welterweight was a guest on this week’s edition of SpikeTV’s MMA Uncensored Live and revealed there is definitely a method behind his madness. According to Koscheck, it pays to be a prick, and thankfully for the 34-year-old, he’s always been that way. “I get a lot of hate. Not only by other fighters, but, obviously, by the fans,” Koscheck expressed. “What’s funny is, I play them all like a riddle. I’m the guy that’s laughing all the way to the bank. I believe the proper expression is, “I play them like a FIDDLE,” but I get his point. Koscheck recently tried to run his antagonistic game on BJ Penn by challenging the retired Hawaiian to a tango. 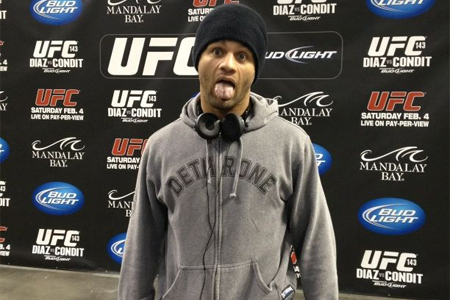 “Me and BJ have a good relationship,” said Koscheck, “It’s business. I like to have big fights. I think that BJ is the type of fighter that would be a big fight for me. Unfortunately for Koscheck, a scrap against him wasn’t quite box office enough to lure the former multi-divisional champion out of the retirement home. In the meantime, Koscheck awaits his next assignment. He was seen last month dropping a split decision defeat to Johny Hendricks.